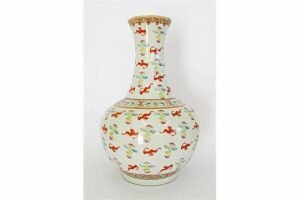 A Large Chinese porcelain ovoid shaped bottle vase with a long waisted neck and a short foot, decorated in Famille rose colours with bats and clouds on a white ground. 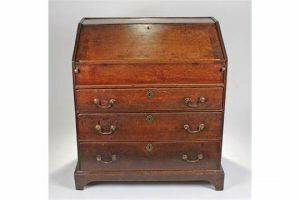 An early 18th Century oak bureau, of deep proportions. The rectangular top with a deep fall enclosing pigeon holes and slide, with a blank frieze and three long graduated drawers, raised on bracket feet. 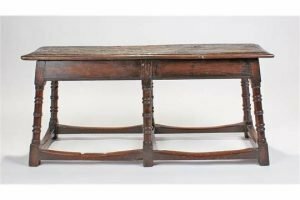 An 18th Century dual stool, the long rectangular top above ring and gun barrel turned legs, untied by stretchers. 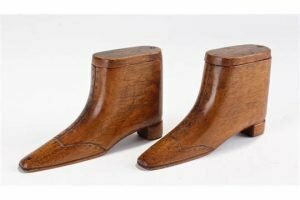 A pair of George III fruitwood snuff shoes, with the swing lids enclosing storage space and buttoned studded boots, heel to the rear. 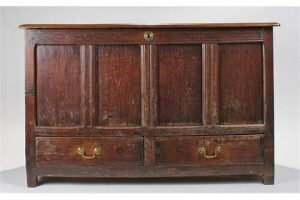 An early 18th Century oak mule chest, the long hinged rectangular top enclosing storage space, the front with four panels held within geometric line carved beams, two short drawers to the base raised on block feet. 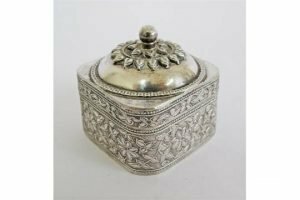 A Mughal sterling silver box with lid. Engraved with foliage to the sides and having a domed lid with petal decoration and spherical finial. Early 20th century. 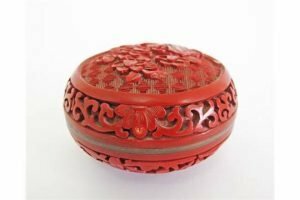 A Chinese cinnabar lacquer round box, mid 20th century, carved in high relief with flowers, within borders of scrollwork, blue enamel brass interior and base. 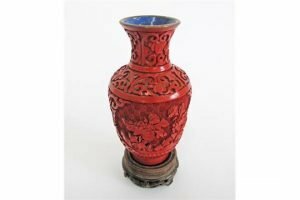 A Chinese cinnabar lacquer vase, mid 20th century, carved in high relief with flowers, within borders of scrollwork, blue enamel brass interior on carved hardwood stand. 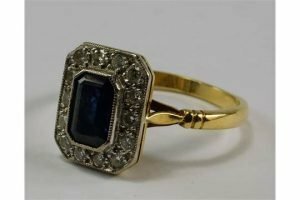 An 18ct yellow and white gold sapphire ring, the step cut sapphire with border of round cut diamonds in an oblong mount with canted corners. 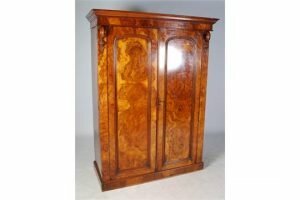 A Victorian walnut wardrobe, the moulded cornice above a pair of arched panel doors, enclosed by scroll bracket details, opening to a fitted interior of sliding shelves and drawers, raised on a plinth base. 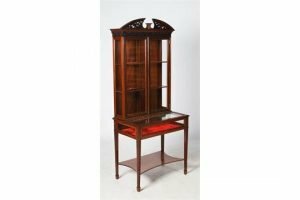 An Edwardian mahogany display cabinet in the George III style, the upright back with split pediment over a pair of glazed cupboard doors opening to a fitted interior of shelves, on a base fitted with a hinged glass panel opening to a red lined interior, raised on four tapered square supports with spade feet united by a shaped stretcher. 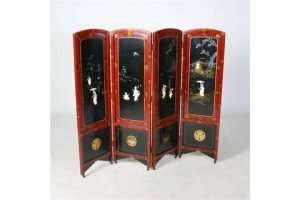 A late 19th century Japanese lacquer, mother of pearl and bone inlaid four fold screen, decorated with panels of Bijin above panels of stylised mons, raised on castors. 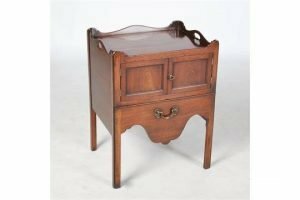 A George III mahogany tray top commode, the rectangular top with shaped gallery and pierced kidney shaped cut out handles, above a pair of panelled cupboard doors and pull out drawer with interior sliding top, raised on square chamfered supports with channelled line detail. 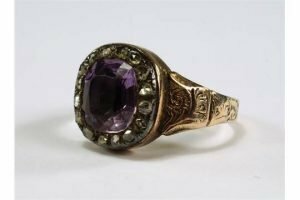 A Georgian amethyst and diamond ring, the oval cut amethyst with border of rose cut diamonds, in closed back setting, engraved foliate shoulders. 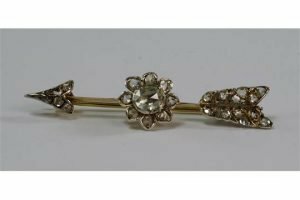 A 19th century diamond set brooch of arrow form, the central flower head set with a rose cut diamond with rough cut diamond border and rough cut diamonds to the arrow head and flight feathers. 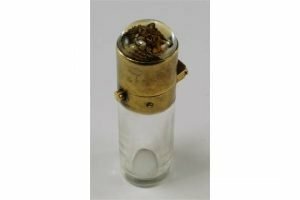 An Essex crystal mounted scent bottle, the clear glass cylinder with gilt metal hinged cover surmounted with an Essex crystal of a cat. 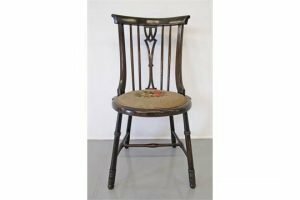 An English Victorian mahogany side chair with turned back slats and round embroidered seat. 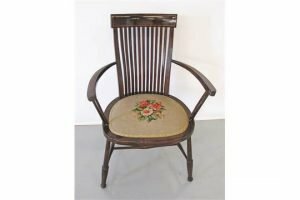 An English Victorian mahogany armchair with satinwood stringing and embroidered seat. 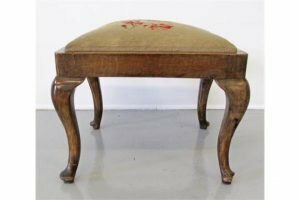 An English Victorian stool on cabriolet feet and upholstered in embroidery. 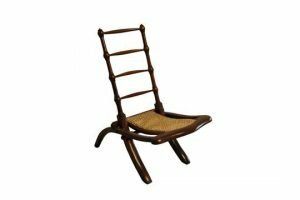 An English folding campaign chair, mahogany with cane seat, early 20th century.